The Nationals righthander cemented his standing as one of the game’s most dominant pitchers on Saturday night with one of the most dazzling lines that the game has ever seen. He allowed neither a hit nor walk while striking out 17 members of the Mets in perfectly overpowering form, denied a perfect game only by an error by shortstop Yuniel Escobar. Of course, there was a time when Scherzer did not yet have that same stature, when he showed tremendous stuff but hadn’t yet harnessed it in a way that he possessed the requisite pitch efficiency to ensure that he had a career as a starter. Moreover, his high-effort delivery raised questions about whether he could remain healthy for the long haul. It was amidst that uncertainty that Red Sox president of baseball operations Dave Dombrowski, when he was running the Tigers, saw opportunity. In December 2009, as part of a blockbuster three-team trade with the Diamondbacks and Yankees, Dombrowski acquired Scherzer, relievers Daniel Schlereth and Phil Coke, and centerfielder Austin Jackson while parting with centerfielder Curtis Granderson and righthander Edwin Jackson. That Dombrowski was able to buy-low on Scherzer says something about him as an executive, a notable part of his history of securing huge hauls in trades. 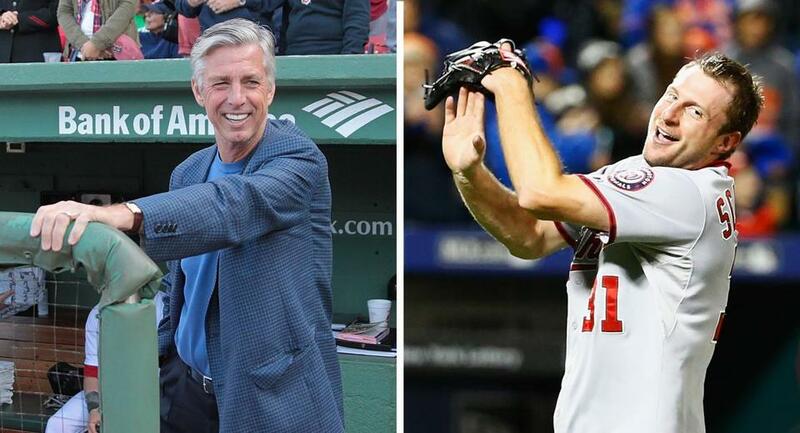 Yet in some ways, for what the Red Sox face this winter, there’s a chance that another transaction — or rather non-transaction — involving Dombrowski and Scherzer is more significant when it comes to examining his potential deal-making with his new club. At the start of 2014, with Scherzer entering his final year before becoming a free agent, the Tigers hoped to extend the reigning AL Cy Young winner. They offered him a six-year, $144 million deal, but Scherzer and agent Scott Boras rejected the offer. The offer and negotiations were notable for a number of reasons. ■ The fact that Detroit made an offer of that magnitude — at the time, it would have been the seventh-most money ever committed by a team to a pitcher — to cover Scherzer’s age 30 through 35 seasons suggests a willingness by Dombrowski to open the vault for elite pitchers in their 30s, something he’d likewise done in extending Justin Verlander. Certainly the views of Tigers owner Mike Ilitch played into Dombrowski’s efforts to retain star pitchers, but while aware of the risks of signing pitchers in their 30s to long-term deals, he did not and does not categorically reject such deals. Dombrowski and the Tigers wanted to add the six years and $144 million onto Scherzer’s $15.525 million salary for 2014 — which would mean that Detroit would have a seven-year commitment of just under $160 million to Scherzer that would run from his age 29-35 seasons. That would represent the fourth-most guaranteed money any pitcher had ever had in the game’s history, behind Clayton Kershaw, Justin Verlander, and Felix Hernandez. ■ Dombrowski, while willing to spend aggressively, has his walkaway point. The Tigers wanted to retain Scherzer, but felt like there had to be a limit to their offer to a player who remained under team control for another year. And so, while resigned to the likelihood that Scherzer would leave in free agency after the season, Dombrowski moved during that year to secure the services of another top-of-the-rotation pitcher. He traded for lefthander David Price at the 2014 trade deadline, knowing that Price would remain under team control through 2015. So, with Scherzer, a picture starts to emerge of how the Red Sox might consider attacking the elite free agents of this coming offseason, most notably pitchers like Price or Johnny Cueto. Dombrowski’s history with Scherzer — the author of two no-hitters this year — suggests a willingness to act aggressively but within limits, demonstrates an openness to make seven-year commitments to pitchers well into their 30s, and highlights the importance that he attaches to having the sort of front-of-the-rotation presence that the Red Sox lacked this year. Follow Alex Speier on Twitter @alexspeier.